Documentary director Arthur Dong has been working since the early 1980s, when one of his first shorts, “Sewing Woman,” was nominated for an Academy Award. Since then, he has directed a series of docs on political and social issues, including 1994’s Peabody Award winning “Coming Out Under Fire” and 1997’s Sundance favorite “Licensed To Kill,” which took a chilling look at the lives of people convicted of violent hate crimes against gay men (Dong himself was a victim of gay bashing in 1977). His latest work, “Hollywood Chinese,” goes in a different but certainly not less imperative direction, examining the placement of Asian-Americans in Hollywood cinema. Premiering at last year’s Toronto International Film Festival, the doc shines a light on decades of underwhelming representations. The film opens Friday, May 2 at New York’s Quad Cinemas. I sat down to edit my first super 8 film in 1970. Didn’t really know what I was doing, but it was night and Tony Scott‘s jazz/Japanese fusion LP, “Music for Zen Meditation,” was on non-stop auto-play. Ten hours later, in the early dawn, I re-emerged with a 5-minute film. I experienced the “zone” and was hooked. To this day, I still lose all sense of real time when editing, my favorite part of the filmmaking process. I’ve always wanted to be a cinematographer. When I graduated from San Francisco State University‘s Cinema Department I applied to the American Film Institute for graduate studies. The AFI’s a conservatory and you pick an area of concentration, i.e., director, writer, set designer. I wanted to go for cinematography but the registrar noted that I didn’t have a substantial background in that field. She suggested I apply for the director’s program instead since I had already received an Academy Award nomination for Best Documentary Short. So there you have it, now I’m a director. Please discuss how the idea for “Hollywood Chinese” came about. I love film history and I wanted to make a film for film lovers. I’m also a fan of that genre of documentaries that examines cinema from a specific point-of-view, and I wanted to tackle the Chinese in Hollywood feature films. So my goal was to combine these interests and make a film that was fun, but yet thought-provoking. I’ve seen documentaries that deconstruct the media’s representation of marginalized groups, and while their content is important, sometimes the presentations can be a bit argumentative and didactic for me. I certainly didn’t want to ignore criticism about the industry, but I also wanted to celebrate some pretty remarkable milestones and achievements as well. Most of all, I wanted audiences to be entertained and the people I interviewed were not only smart, but were a hoot! What were some of the biggest challenges you faced in developing the project? 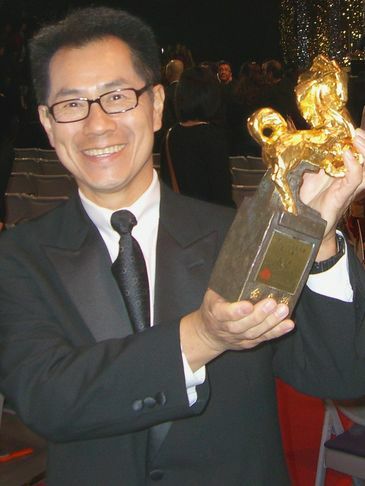 Arthur Dong won the Golden Horse for best documentary. Image courtesy of the filmmaker. How did the casting for the film come together? I wanted to interview a variety of film artists, including directors, writers, and actors. I also wanted to check in with non-Asian actors who performed in yellow-face, where they wore make-up to play Chinese characters. This was important to me since their unique perspectives haven’t been heard very much and their work is often criticized from just one point-of-view. I was lucky to have interviewed Luise Rainer (“The Good Earth,” 1937), Turhan Bey (“Dragon Seed,” 1944), and Christopher Lee (“Fu Manchu,” 1960s) who were all pretty candid. I also wanted my cast to form a collective narrative arc for the film, where we can follow their journeys into the film industry on a personal level. This was important for the structure of “Hollywood Chinese” because I already had two lines of story development, one chronological and the other thematic, and I needed a dramatic through-line to help glue it all together; I wanted to build to an emotional impact by the end of the film and the personal stories provided that underlying thrust. What are some of the creative influences that have had the biggest impact on you? I first realized that film could leave an emotional and intellectual effect on viewers when I saw Alfred Hitchcock‘s “The Birds” in 1963. I was held in total suspense and I so wanted answers to the bizarre events in that film. At the very end, we see the stunned protagonists walking through a field of birds, all just sitting, but perhaps ready to attack again, and then the film ends. I was just astonished and for days tried to figure out what happened and what will happen. I remember thinking to myself that I’d like to do that, to create a film that crescendos to an open-ended conclusion that invites any number of interpretations. To this day I try to end my films not with a definitive statement, but rather, one that can be dissected, discussed and read in different ways – that for me would be a successful film. What other genres or stories would you like to explore as a filmmaker? What is your next project? I attended the American Film Institute to study narrative filmmaking and came out of that institution with a half hour short, Lotus, about a family of women in 1916 China grappling with the custom of footbinding. Part of AFI’s service is to set you up with executives and agents. At more than a few of these meetings, they’d heap praise on my talents as a director, but then offered, “You did a film about China, with all Chinese characters, and you’re Chinese. We don’t know what to do with you!” Now, this was 1987, pre-Ang Lee, pre-John Woo, pre-Justin Lin. You wouldn’t hear that today, at least not so bluntly. But that was then and I had a documentary project I was working on so I just thought, “Who needs that? !” And it’s been non-stop since with docs and life’s been good. But that doesn’t mean I wouldn’t want to re-visit narrative filmmaking. As for my next project, I’d like to spend more time with my son. I’m focused on distribution now and I can say that the changes between now and 1982 when I first ventured into self-distribution is…gee, I can’t think of a word big enough to describe the differences! Back then it was previews on 16mm, not DVDr screeners; phone tagging, not emails; catalogues, not websites; purchase orders, not online shopping carts; slides and photo prints, not jpegs; mass mailings, not E-blasts – I can go on and on, and I’ve just started exploring the possibilities of internet downloads and such. I’m not necessarily talking about theatrical distribution, but there are now many more tools available to help filmmakers remain somewhat independent through alternative means. What hasn’t changed, however, is connecting with an audience. The core task of identifying your target audience and making sure that they’re engaged is still a very human and thoughtful process – and that’s good. As a gay Asian American filmmaker I’d be naive to think that anti-gay bigotry and racism has not affected the opportunities or lack thereof in terms of my work. But the way I confront it is to first acknowledge whatever factors I think might be there, and then forge ahead anyway with that knowledge. We all have thrust upon us unwanted external forces that we have no control over, whoever we are, and if we allow them to be barriers (excuses?) to our goals, then we may as well give it up because perseverance, passion, and stamina is a must for independent filmmakers. Please share an achievement from your career so far that you are most proud of. It’s got to be the “Out 100 Award” given by Out Magazine. I had been on the road with my film “Licensed to Kill” for about a year, self distributing to theaters, conferences, festivals and community groups. The award’s inscription read: “for waging a one-man anti-violence project with his documentary on convicted murderers of homosexuals, ‘Licensed to Kill. '” That was pretty cool and made it all worthwhile.